Are you wondering why I called this post Picasso’s Thank You Note? It is because I wanted to thank Picasso for introducing me to a Facebook group on card making using rubber stamps. It is nice to have a positive break from all the horrible news stories. When I see the news, I usually think how dreadful. However, when I see the posts from the group, I think how beautiful or other positive adjectives. Based on my research, butterflies are considered to be a symbol of endurance, change, hope, and life. This is why I decided to feature them in cards as a response to all the horrible news stories that bombard us everyday. I hope that seeing butterflies might inspire some positive change. I call the technique I used to make this thank you note the stamp and reveal technique. First, you apply all the colors you want to use. Second, you cover it all with black ink. Third, you stamp to reveal some of the color you applied in the first step. If this idea sounds familiar, then you probably did something similar to this with crayons when you were a kid. At the very bottom of the post are additional cards designs for inspiration. V1: 4″ square from glossy white cardstock, 4 1/2″ square from red cardstock, 4 3/4″ square from pink cardstock, and a 5″w X 10″ l rectangle from glossy white cardstock. V2: 3 1/2″ X 4 1/2″ rectangle from glossy white cardstock, 3 3/4″ x 5″ rectangle from yellow cardstock, and 5 1/2″ w X 8 1/2″ l rectangle from red cardstock. Create the card base. Along the length of the card, make a score a line in the middle and fold in half. V1 has a 5″ square card base. V2 has a 4 1/4″ X 5 1/2″rectangle card base. Cover the entire glossy panel with colored markers starting with the lightest color. Apply the pigment ink over the entire panel. (Work as quickly as possible.) Take the black refill and squeeze a few drops at a time onto the panel. Then use the cosmetic sponge to spread and apply. Continue until all the markers are covered over. Stamp the butterfly onto the panel using the photo for reference. Apply heatgun to dry panel. V1: Ink up the thank you stamp with black ink. Stamp on white paper. Either apply heatgun or wait until it dries and cut out. V2: Ink the thank you stamp with silver ink. Stamp on the upper right-hand corner. Apply heatgun to prevent smudging. V2: Use stencil brush to apply a light dusting of the silver ink. Apply heatgun. Assemble card using glue. Use photo for reference regarding order of layers. V2: Apply glossy accents onto butterfly and allow to dry. Note: Don’t worry if you cannot achieve 100% coverage of the markers. You can still create really cool designs like the fairy or Japanese lady. To me the idea is to just have fun and experiment. It isn’t too late to create a beautiful watercolor peony card for Mother’s Day or for another occasion. In previous posts, I have shown you how to create dimension and depth by using Copic Markers. (Links to the Copic Marker posts can be found at the bottom of the introduction.) Today, I am going to share with you how to create a similar effect in order to create this watercolor peony card. I find art reference extremely helpful. That’s why I was so happy to remember that I have photos of peony flowers that I can share with you. *I included links to materials used for reader’s benefit. No compensation was involved. Ink up image. Stamp on watercolor paper. Let it dry for a few minutes while you review the photographic reference. Use this image as a starting point for the next step. You should try to notice the following: where the light is hitting the flowers, where are the petals the darkest, where are the petals the lightest, and that the lightest areas look almost white. Select two color pencils for each area. One pencil should be for the darkest area and the other for medium areas. Color in the elements starting with the darkest areas first and then to the medium. Remember to leave some areas blank for the highlights. For the vase, you could choose one dark rich color. Apply it the heaviest where the shadows might be. The darkest areas could be just below the flowers, the side edges and the line just above the base. If you decide that the light is dead center on the vase, then that area should be the lightest. When you use the brush, the you can create the transition between the areas. Color density is done with layers in watercolors. So, it is better to apply the colored pencil on the light side, and then add more after using the brush. Use the brush to transform the color applied via the pencil into watercolor. If the color got too light, then apply more pencil. If the image seems to flat, then consider adding a third color to the area. Experimenting is a good way to determine which way creates results that are most pleasing to you. The photo above shows slightly different ways of coloring the flowers and three ways to handle background. To finish the card, assemble it using the photo for reference. The design for this free copic marker card making tutorial would be a beautiful card for Mother’s Day, a Wedding or a Bridal Shower. If you have never used copic markers before, then you might want to take a look at the prior two posts on copic markers. To learn about copic markers click here. To see a beginner friendly copic marker card project click here. As you build up your rose, you are going to want concentric circles of darkness with sharp highlights. The end result is your image is going to have mostly dark and light areas. 2) Stamp your image using Colorbox Dye Ink in black onto white cardstock copic panel. 3) Select three shades of each color that you will be using: light, medium, and dark. 4) Apply the base color. Start with the lightest marker for the color you selected for the roses. Completely cover each flower. 5) Start applying the dark marker to one petal at a time. The darker areas go on the inside edge of a petal. So any area where the petal is going towards the center of the rose. Also, apply a little bit of the dark marker to the outside edge of the petal. 6) Apply the medium shade to the rose. Tip: If you aren’t achieving the desired result, then you might want to rethink the shades chosen like I did. I went back and chose a different shade for the darkest yellow. Then I applied it. 7 ) Apply the base color. Start with the lightest marker for the color you selected for the leaves. After you apply the allover base color you will apply the shadows. You’ll create the shadows by applying the darkest shade to the veins of the leaves and a little to the bottom of the leaves. Finish by applying the medium shade. 8) Score card base in order to create one with the folded dimensions of 4 1/4″ X 5 1/2″. Using the photo for reference, glue panels to card base. Would you like your hand-stamp images to have shading and dimension like fine art? If you would, then one option for achieving this result is copic markers. From this copic card tutorial you’ll be introduced to the technique of working with copic markers. If you are unfamiliar with copic markers, then click here to go to the copic markers introduction post. I made design choices for this tutorial with the beginner in mind. The stamp image had to be beginner friendly. That is why I chose a large single rose stamp with shadow detail. A large single rose is beginner friendly because it is easier to see the detail and to color it in. It is also a budget friendly approach to working with copic markers. This way you only have to invest in three markers vs. three markers for each of the colors used. This can add up. Black ink is typically used in this type of card project. I chose a ink color that is closer to the flower color than black. I have found it to be a more forgiving color choice for beginners. Note: Companies did not compensate me for products mentioned in this post. I provided the links to make it easier for you to find the products I used. To go to the product page, just click on the bolded/underlined product name below. Copic panel: cut a 3″ square from white cardstock. Ink up image and stamp on panel. Choose three shades of a color for your rose–light, medium and dark. Take the lightest shade marker and apply a base coat to the entire flower. Apply the dark marker to one petal at a time. Take your cues from the stamp details. The darker areas go on the inside. So any area where the petal is going towards the center of the rose. Also, apply a little bit of the dark marker to the outside edge of the petal. Apply the medium. Decide which areas you want to be highlights. These areas you won’t apply additional ink from the medium shade marker. Cut the following: cut 4 1/2″ X 9″ rectangle for the card base, cut a 4″ square from the decorative paper, and a 3 1/4″ square from the solid cardstock color. The folded card base is a 4 1/2″ square. Score the base accordingly and fold. Assemble card using the paper glue. First center the decorative paper on the base and glue into place. Repeat the process with the 3 1/4″ square and then with the copic panel. This Fall Happy Thanksgiving card was created just in case a reader wanted to make the card from the previous post, but didn’t have a die cut machine. You’ll get to use the same time saving technique for color application that was used in the previous post. 1-Create Card Base. Cut a piece of white cardstock into a rectangle that is 8 1/2″ length X 5 1/2 ” width. Score the card creating a folded card that is 4 1/4″ x 5 1/2″. 2-Develop focal panel. Cut a 3 3/4″ X 5″ rectangle from white cardstock. Apply ink to the panel with a color duster in the following order: Banana, Tangerine, Artichoke and Spearmint. 3-Apply ink with cosmetic sponge: Strawberry, Tangerine, and Chocolate. You can apply more of the other colors using the sponge, if you think it needs it. 4-Stamp leaves on panel. To create interest, you should vary how you stamp the leaves onto the card. You can change the direction of the stamp and how much of the image get stamped onto the paper. Stamp the Oak leaf using Artichoke and stamp the Aspen using Chocolate. 5-Create the frame for the focal pane by cutting a 4″ X 5 1/4″ rectangle from brown cardstock . 6-Stamp Happy Thanksgiving–ink up stamp with chocolate dye. Stamp on white cardstock. Trim creating a 1/4″ border. The changing colors of leaves in Fall inspired this card design. In this free Thanksgiving card making tutorial, I share two time saving techniques. The first technique is how to make the color on the leaves mimic the real thing. The second technique is on assembling. 2-Apply ink to a strip of white cardstock with a color duster in the following order: Banana, Tangerine, Artichoke and Spearmint. 4-Following the instructions of the die cut machine you own, die cut the leaves out of the paper you just colored. Die cut the 3 1/4″ oval out of brown cardstock. 5-Cut the following: 4″ X 5 1/4″ rectangle from brown cardstock and 3 3/4″ X 5″ from orange cardstock. Time saving tip: Apply glue around the edge of the oval and quickly place the leaves around the edge. This is a great card project for kids to make for father’s day. The materials used were the following: Striped Cardstock, Coordinating Solid Color Cardstock, White Cardstock, Double Sided-Tape, Scissors, Ruler and Pencil. See photo for the dimensions of the other pieces to cut. Cut two triangles for the collar. Refer to photo for the amount to cut off from the outside top angle. Tie–cut the blue strip as marked in the photo to create the tie. Use doubled sided tape to attach pieces. If you don’t have all the materials listed, then substitute with the materials that you do have. 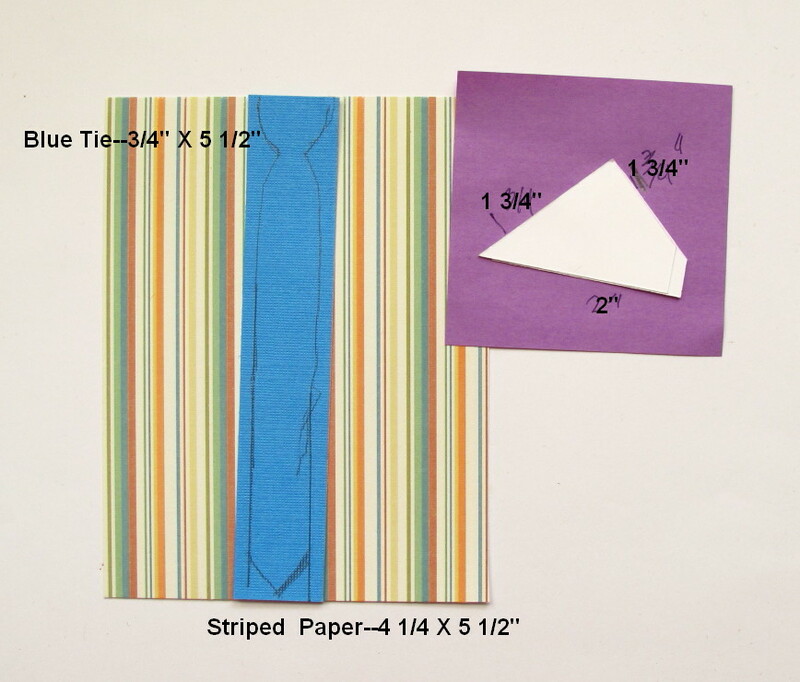 For example, if you don’t have striped cardstock, then choose a paper with a paper with a pattern that you can imagine a Dad wearing. You could also try striped wrapping paper. If you have materials to color with, then transform white paper into striped paper. If you don’t have double-sided tape, then use glue. Presenting the bride with DIY Bridal shower card that matches the wedding colors adds a nice personal touch to the event. Below are the step by step instructions for this card making project. White cardstock was used to create the card base with the folded dimensions of 4 ¼” x 5 ½”. Silver background panel is 4” X 5 ¼”. Stamp roses in Berry ink on white cardstock panel that is 3 ½” X 4 ¾”. Stamp ferns first in Wild Lime then in Golf Course green to create depth. Use blender pen to add Chiffon color to the roses. After the flowers have dried, stamp over them with the watermark pad and emboss in pearl. To create the baby’s breath flower, apply the white ink with the stencil brush. Use cosmetic sponge to create the background color. First apply the Thistle and then apply the denim. To create the soft flowing dangling flowers, use the blender pen to dot the white ink. After it dries, apply very small dots of glue and sprinkle with glitter.